If you are a fan of Lady Gaga or the National Basketball Association, you may have heard about an old piece of exercise equipment that is making a comeback. It is called the VersaClimber. It was invented in 1981. It is a combination of a stepper and climber. It involves moving your arms and legs. It looks like a device you might hang clothes on, but it is really for exercise. 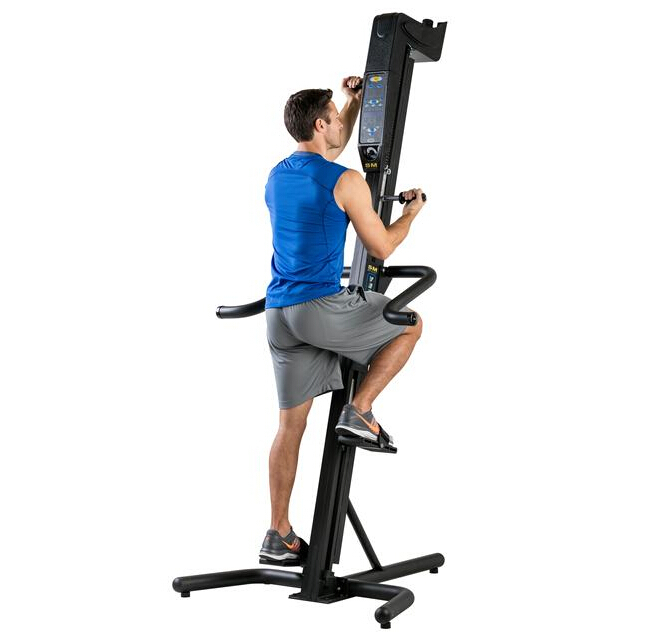 It is not very common to see people using a VersaClimber at gyms. It is not as popular as other workout machines. Lady Gaga talked about using the VersaClimber to get ready for her energetic halftime performance at the Super Bowl earlier this year. LeBron James, who plays for the Cleveland Cavaliers basketball team, put up a video of himself using a VersaClimber last summer. He posted the video just three weeks after the Cavaliers won the NBA championship. James has since introduced his teammates to the machine. The machine seems to work. Viewers were impressed with Lady Gaga's show at the Super Bowl. And the Cleveland Cavaliers have done well in this year's NBA playoffs. The website ESPN.com recently ran a story about how the Cavaliers have been using the VersaClimber. It has led to a lot of discussion on social media about the benefits of the exercise machine. Cleveland used VersaClimbers to get ready for its NBA playoff games against the Boston Celtics. Dave McMenamin wrote the ESPN story. He said the Cavaliers have contests to see who can climb the greatest distance on the machines. Tristan Thompson plays for the Cavaliers. In the story, he said the VersaClimber is "the best machine in the weight room, but it's the one everyone hates the most." The magazine Men's Fitness published an article about the VersaClimber earlier this year. It said the machine provides one of the best workouts for weight loss. Brett Collins works for VersaClimber. He said the machine was at its most popular about 30 years ago. But its popularity is rising once again. Now, some gyms are even offering VersaClimber classes for their members. I also do a great deal of work in the weight room, including squats. The weight loss began to look more serious. Carol and her husband Jack have a lot of exercise equipment at home. 1.Lady Gaga talked about using the VersaClimber to get ready for her energetic halftime performance at the Super Bowl earlier this year. 2.But its popularity is rising once again. Once again he was disappointed in love.